The mobile solution is perfect for schools that lack physical space. 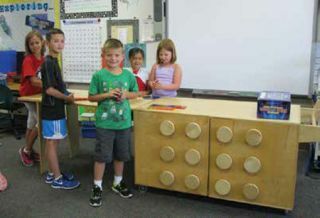 Harrop says teachers frequently check out the engineering cart, which has K’NEX, Legos, magnet blocks, and tubing connectors, for lessons on 3D geometry and machines. “The students construct tangible versions of what’s on their paper. It’s a huge learning opportunity,” she says. Younger students love using Osmo (on the Tech & Robotics cart) with their iPads to learn about numbers and words and play Tangram, a puzzle matching game. Recently, the art teacher used Osmo for a self-portrait project. Harrop says the makerspace has brought about enthusiasm and other positive changes. “We immediately noticed that some children who hadn’t had a forum to be leaders were showing up as leaders.” Behavior problems decreased and students are willing to clean up and take care of the materials. Best of all, perhaps, is the fact that students are also improving their social skills and character development. Makers at Shorecrest Prep can’t wait to tinker and create in their makerspace. The library/media specialists at Shorecrest Preparatory School in St. Petersburg (FL) were so determined to start a makerspace that they went a little rogue to do so. They got a grant, bought a 3D printer, and started reconfiguring the library to free up space. They asked for donations from parents and received a ton of craft supplies, Legos, and K’NEX. That’s when the technology department saw what was happening and stepped in. “The technology department got $10,000 from the head of school, which we used for a laser cutter, another 3D printer, movable tables, containers, and makerspace books and kits,” says Dottie Smay, library/media specialist. Smay attended makerspace Webinars and created mini-lessons for parents and students so they could understand the makerspace’s purpose and value. She held teacher workshops during which she pointed out curricular tie-ins and started an afterschool club. High schoolers in Yorktown (NY) entered a challenge to buy more tools for their makerspace. When Shannon Mersand, School Media Specialist at Yorktown High School in Yorktown (NY), visited the Google offices in New York City a few years back, she and her colleagues were fascinated by the Lego play stations and open areas where employees could decompress. “Our students are stressed from all the pressure of work and studying, and we wanted to give them a few outlets to relax,” she says. She mentioned the idea to a couple of teachers, and a few days later she was holding an enormous tote full of donated Legos. She stuck it in the middle of library. Within days, students were building things and asking to display them. From there, Mersand asked for donations of K’NEX and board games. She created whiteboard tables that students use to doodle, brainstorm, and help each other study. Once her principal obtained Board approval, she eliminated 15,000 books (many of which she donated to a neighboring high-needs district). She placed makerspace materials on the shelves and started a student-run Genius Bar. To get more makerspace supplies, the Genius Bar students entered a challenge by Khan Academy, Google, and DonorsChoose and earned $1,000. They bought a da Vinci Duo 3D printer. Thanks to a grant from a local education foundation, the school was able to purchase Arduino kits, MaKey MaKeys, and a Raspberry Pi. Students in the CDOS (Career Development Occupational Skills) program started with Snap Circuits, moved to paper circuitry, and are now working on sewable circuits. They’re planning to create items to sell in the school store. One student is printing a prosthetic hand that he will pair with an Arduino board to make it move. A group of sophomore English students are participating in 20-Time projects, and many of them will use the makerspace to create their final product. Teacher integration is picking up, too. Math teachers have used the space to teach about conics and English classes used it for a research project, including one student who’s creating an alternative energy source. Classroom work is infinitely more engaging with a mobile makerspace. Last summer, Nick Greenwood and Nancy Kellner, a librarian and technology specialist at Peaslee Elementary School (part of the Public Schools of Northborough and Southborough [MA]) received a grant for a mobile makerspace. “Now we’re trying to help everyone develop a maker mindset,” says Jennifer Trombino, instructional technology specialist for the district. Trombino says that many teachers think of the makerspace as a playroom with no curricular value, so she helps them to see the value. “Our goal is to get people creating, asking questions, solving problems, and innovating,” she says. Peaslee teachers sign out Bee-Bots, Osmos, and other maker materials to use in their classrooms. Younger students use Bee-Bots to identify letters, numbers, and sight words; older students use littleBits to learn about circuitry.